Alone in the city: Paul Durcan’s ‘The Beckett at the Gate’. Guy Debord exhibition in UCC and Psychogeography in Ciaran Carson’s Poetry. The History of Irish Short Fiction. What Remains of Bowen’s Court? Gerry Barry is an artist from West Kerry who works in a number of interesting and innovative mediums. He works most notably as a land artist. Denise Hall in her article in the Irish Examiner explains the concept succinctly, “Like the principles of the land art movement, the installations are meant to co-exist with the elements of nature, which are themselves an ever-changing work of art.” Hall explains that it is a movement which grew with vehemence in the late sixties and seventies. It originated as a protest against “the increasing artificiality of art, and occurred simultaneously with the emergence of the environmental movement.” Barry himself began as a painter until he found that the sea, mountains and lakes which he depicted demanded more interaction than painting as an interface. 1975 marks the beginning point for Barry’s landscape and natural elements work and he can now safely claim his title as the longest working Irish Land Artist. Employing natural elements to create his works of art, Barry is particularly interested in water and the sky, those two most liminal elements which intoxicate the human mind with their neither-here-nor-thereness, and the unfathomable realms which we try to capture but inevitably fail. When asked how his work came to take this form, his answer is that works such as ‘Spiral Jetty’ and ‘Running Fence’ kick-started his imagination. ‘Spiral Jetty’ is an earthwork sculpture created by the American sculptor Robert Smithson in April 1970. The construction of it was also documented in a 32-minute film. ‘Running Fence’ was an installation piece by Christo and Jeanne-Claude, completed on the 10th of September 1976 and deconstructed fourteen days later, leaving no trace. These pieces started him thinking about what he could create from the landscape himself. He continues to gain a lot of inspiration from the artist David Hockney (very popular in the 60’s in England) and evidence of this is seen in his work. Of course, when dealing with something as temperamental as the elements, (especially the Irish ones) issues of permanency are out of the hands of the artist but Barry explains that leaving it up to nature is part of the point. The influence of nature, the changing seasons, ageing, the forces of wind, water and sun, evolve the works and allow them to surpass how human hands attempt to control them. The installations are designed to harmonise with nature and some of them still exist in spite of them having been installed as far back as the 1970’s. Barry is a prolific artist in spite of the fact that his work demands that he waits for conditions to be right. His patience is rewarded in the ephemeral artworks he creates that are wonderful in the truest sense of the word. He mainly works in Kerry which is the environment he grew up in. He describes the landscape dominated by lakes, mountains and the sea as occasionally “overpowering” and inevitably attempting to capture this in art is a daunting endeavour which Barry does not seem to be deterred by. A true love of this landscape is what motivates his work. This creates a singular and extraordinary relationship with the place that viewers are invited to share. Barry uses a Nikon D5000 to photograph his works upon completion in order to document them but the best way to experience his work is to visit them in the setting which inspired them. The flip down viewfinder of the D5000 allows him to use different angles, which is helpful given that Barry works a lot on the edge, such as where the sea meets the sand or river. The reflective quality of water is particularly alluring to Barry. 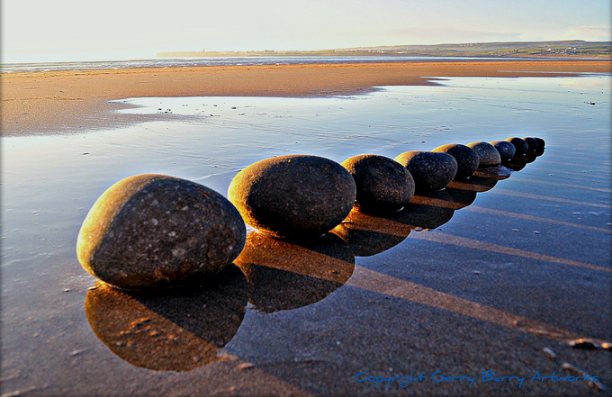 He said “it’s extremely powerful and the way people and humans can be drawn to water is phenomenal.” Barry is an artist who feels much anchored in his own place, which is unsurprising given that his work is rooted in it. His father was a great source of encouragement and inspiration for him. 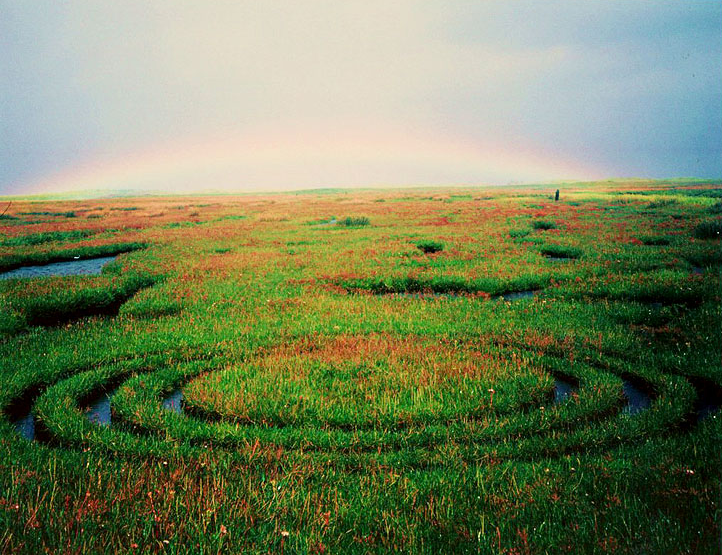 After his death, Barry made the work you see below, a triple circle cut out of a salt marsh with a spade his father had made. Just as he photographed it, a rainbow serendipitously appeared and added a symbolic element to a work which already had personal significance. I was interested to find out if the author and cartographer Tim Robinson had any impact on his work. Robinson produced a fascinating and special map of the Burren which was, as Barry puts it, simultaneously “a history, a geography and storytelling.” The microscopic attention to detail in Robinson’s documentary style books Stones of Aran: Pilgrimage and Stones of Aran: Labyrinth bear certain similarities with Barry’s land art. Both attempt to realise nature in a form which inspires wonder. Both inspire an awareness of the world and also allow us to interpret the elements in a new manner. Barry and Robinson met briefly in Roundstone in what I imagine to be a great meeting of like minds. He is a graduate of three art colleges which justifies his right to question why they are almost all located in cities. As an artist who takes his inspiration from nature, studying in cities did not provide the canvas or inspiration he needed for his work and he preferred walking the beaches and mountains than spending time locked in a studio. He sees art as a response and not something which can be contrived. Art is something happening outside the window for Barry, so that is where he likes to work. 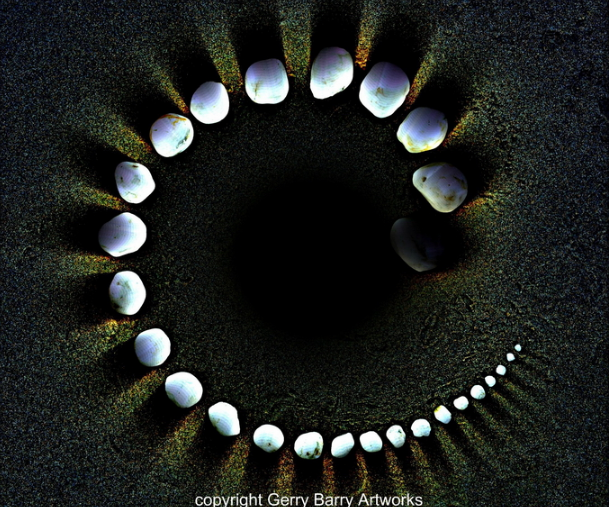 Spiral shapes are a common feature in Barry’s work and serve to complement the primal, eternal essence of the natural world. Barry is not interested in galleries; instead he uses the beach itself for his exhibitions. His site of choice is a part of West Kerry where the river flows into the sea, a mile or two outside of Castlegregory. He informed me of one such exhibition which took place as part of the Feile na Bealtaine festival in Dingle. It lasted a weekend, and contained fifteen works which he wanted to look like the work of fifteen different artists. The large attendance at this event is testament to how people respond to the primal. Barry surprised me with an opinion which many may find interesting, “Man has a lot to learn in terms of where they’re living. In fact, men have a lot to learn from women. Women know how to live on this planet, they are not the ones who go to war or greedily run companies.” His art is trying to return to what he reckons we should be focusing on, our immediate surroundings. He wonders why we as humans feel that we have to send a comet into space to go looking for a new place instead of embracing and nurturing the one we have. In an effort to do this, his work tries to compliment nature, and return to the simplicity of nature which has been shoved aside by technology. Having said that, the internet has provided a great outlet and means of display for his work, he is taking the best of what it offers and the response to his work online has reassured him in what he’s doing. Alongside this type of work, are his landscapes done in colour pencil, mainly using the colours brown and blue which are layered. He also draws realistic characters from his locale and he has no problem shifting between mediums. Barry maintains that, “Being an island people, we are a spiritual country, we are in touch with the clouds and that is why the weather dominates our minds. When people talk about the weather, what they are actually talking about is nature and the clouds.” This spirituality finds its way into his work when he examines stories from the bible from a new perspective. One such work is title “Famine of the Soul” and features the bones of a fish which is intended as juxtaposition to the fish which Christ fed to the masses. Another work is a revitalised image of the Madonna and Child, but of a father and daughter iconised. From this, it is clear that stories of the bible fascinate him, but as to whether one belief system informs his thinking, the answer is more ambiguous. Barry is spiritual, but does not conform to any one belief system or doctrine. -Barry, Gerry. All Artwork. Gerry Barry Artworks. Web. 17 Nov. 2014. 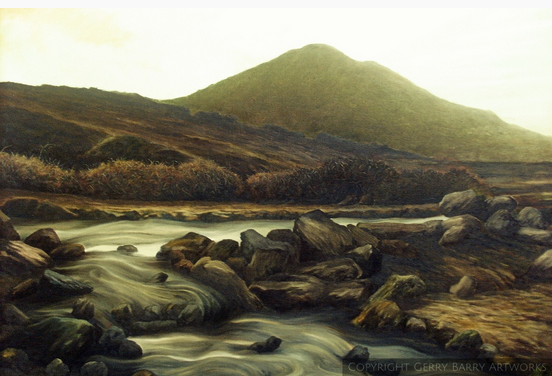 <http://gerrybarryartworks.com/&gt;. Published with permission of the artist. -Ganchev, Ivan. “Eco Art – Environmental Land Art by Artist Gerry Barry.” Art Cocktail. N.p., 30 Aug. 2012. Web. 17 Nov. 2014. -“Interview with Gerry Barry.” Personal interview. 14 Nov. 2014. English Literature and Classical Civilisation graduate from Trinity College Dublin, now studying a Masters in Irish Writing and Film at University College Cork. Main interests include psychoanalysis and psychopathology relating to female Irish writers and gothic literature. Thoughts and literature I encounter as I research throughout my Masters. The fictional diary of an utterly fictional John Banville in his fictional universe.